We will fully immerse ourselves in the Tsars' lavish summer residence - so splendid that it rivals Versailles - and we will end our excursion with a stroll through the gardens with numerous fountains. We will travel south-west by coach until we reach Peterhof , also known as Petrodvorets, the most beautiful Tsar summer residence. 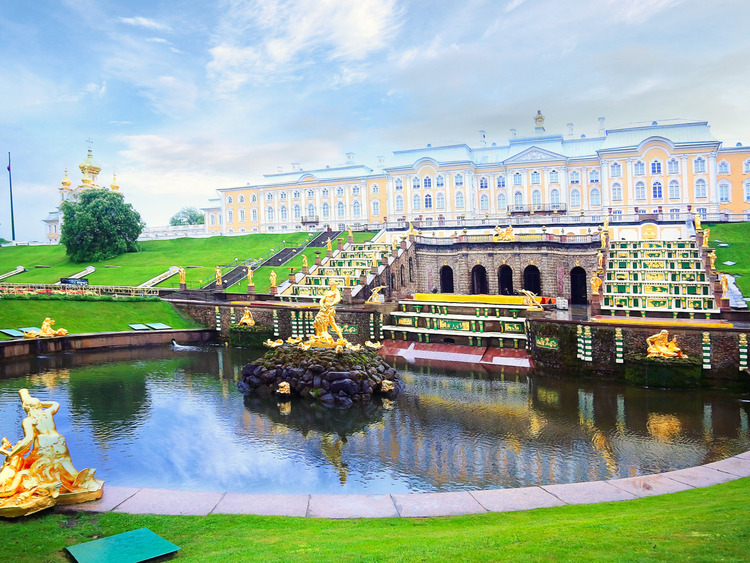 This maze of palaces, fountains and gardens was commissioned by Peter the Great at the start of the 18th century in an attempt to compete with Versailles, and became a public museum and gardens after the October Revolution. We will explore the rooms in the main building, known as the Grand Palace, built by Italian architect Bartolomeo Rastrelli. Then we will head outside for a stroll through the majestic Lower Gardens, an area spanning 120 hectares, packed with pavilions and palaces overlooking the Gulf of Finland. This estate will enchant us with over 150 fountains and four waterfalls decorated with statues of mythological characters. Imagining life in the imperial court, we will wander across the garden pathways at this historical place before boarding the coach again that will take us back to the port. The coach transfer to Peterhof Palace takes approximately 1 hour. The tour includes a wait before visiting the palace and an itinerary on foot lasting approximately one and a half hours. It is not permitted to use cameras inside the palace. Wheelchairs and pushchairs are not allowed inside palaces and museums.